The team at FlexiSPY are excited to announce that we have just introduced a service much requested by our customers – the FlexiSPY Remote Installation Service! What is the FlexiSPY Installation Service? This service was made for people who don’t have the time to root an Android device themselves or jailbreak an iOS device, but still want a quick and easy way to install FlexiSPY. Rooting, jailbreaking, FlexiSPY installation, and configuration is all taken care of by us. In short, the FlexiSPY installation service lets you schedule a time where an experienced technician will remotely log into the phone you’d like to install our software on, and configure and install FlexiSPY onto your iPhone or Android device. *Note, you still need physical access to the target phone. The FlexiSPY remote installation service is relatively simple, but you should still read through our points below to get a good idea of how it works. You purchase our Installation Service as part of your FlexiSPY subscription purchase or as a standalone product if you have already purchased FlexiSPY. If you are purchasing the service with your subscription you will see a button to add the worry free installation service during checkout. Get the iOS or Android device physically in your hand. Start a live chat with a technician to begin the rooting or jailbreak process. Sit back and relax as the device is rooted or jailbroken for you. Once the rooting or jailbreak has been completed the technician will then install FlexiSPY for you. To keep things simple we’ve set a standard price of $39.99 – regardless if you are purchasing the installation service as a standalone product or as an addon during checkout. There are a few things to bear in mind when purchasing the FlexiSPY installation service. 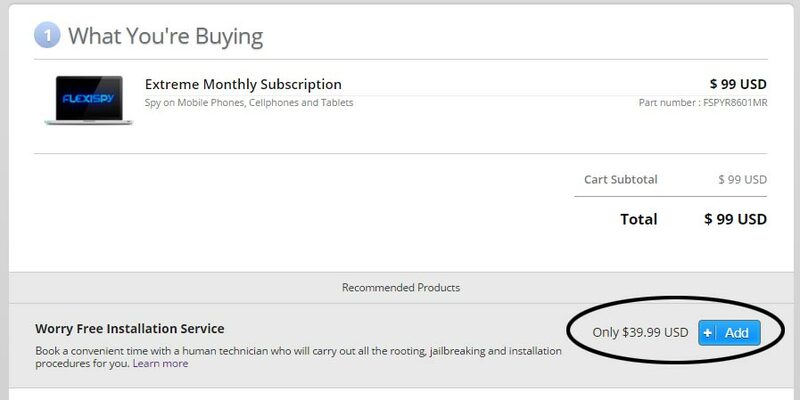 – The latest jailbreakable iOS version that we are compatible with is iOS 9.1. 3) For the rooting process, the Android device will need to be connected to your PC, it will not work if connected to a MAC. 4) Most Android phones can be rooted, however there is a chance that the phone can’t be rooted. If this is the case then you will be refunded the price of the installation service. 5) While legal, there is always a risk associated with when rooting and jailbreaking phones. A common repercusion of a failed root being loss of data. Our Installation Service team will notify you before installation if your phone is a high risk phone or not, but it’s good to keep this in mind. If you have any questions about the service, please let us know in the comments section below!